Robert Peter George is an American legal scholar, political philosopher, and public intellectual who serves as the McCormick Professor of Jurisprudence at Princeton University, a celebrated endowed professorship previously held by Woodrow Wilson, Edward S. Corwin, Alpheus T. Mason, and Walter F. Murphy. He founded Princeton’s James Madison Program in American Ideals and Institutions in 2000 and continues to serve as its director. George grew up in Morgantown, West Virginia, the grandson of immigrant coal miners. He was educated at Swarthmore College (B.A. ), Harvard Law School (J.D. ), Harvard Divinity School (MTS in Social Policy), and Oxford University (D.Phil. in philosophy of law). At Oxford, he studied under John Finnis and Joseph Raz. George is the Herbert W. Vaughan senior fellow of the Witherspoon Institute, a senior fellow at the Hoover Institution, a research fellow at the Notre Dame Center for Ethics and Culture, and a Visiting Professor at Harvard Law School. 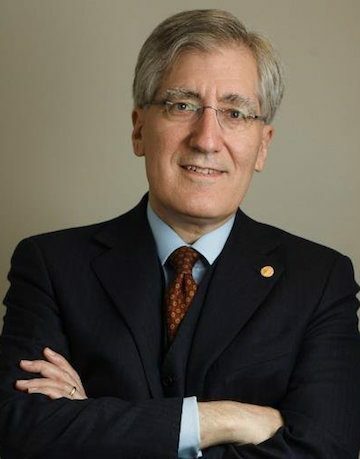 George served on the President’s Council on Bioethics and UNESCO’s World Commission on the Ethics of Scientific Knowledge and Technology; and is a member of the Council on Foreign Relations. In 2008, he received the Presidential Citizens Medal, one of the highest honors that can be conferred on a civilian by the President of the United States, at a ceremony at the White House. He is the author of many books, including Natural Law, Liberalism, and Morality; The Meaning of Marriage: Family, State, Market and Morals; Embryo: A Defense of Human Life; What is Marriage? Man and Woman: A Defense; and Conscience and Its Enemies: Confronting the Dogmas of Liberal Secularism.